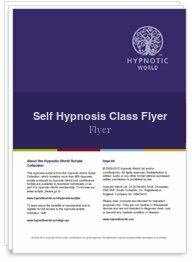 If you wish to offer this service as an excellent way of getting yourself known with prospective clients then this document can be adapted as a flyer to advertise classes for self hypnosis. It is designed in Word format to make it easy for you to adapt. Self hypnosis classes could be held at a local college, your village hall or even in your own home if you're lucky enough to have somewhere suitable. If you make your own CDs you could even sell them to your students or offer promotional material such as informative booklets, leaflets, business cards etc.